With a stay at Airy Karang Setra Sindang Sirna Dua 363 Bandung in Bandung, you'll be within a 10-minute walk of Barli Museum and Karang Setra Water Park. 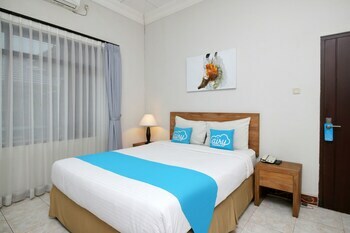 When you stay at Ziva a Boutique Villa in Seminyak, you'll be near the beach, within a 15-minute drive of Seminyak Square and Legian Beach. A roundtrip airport shuttle is available for a surcharge. Located in Palu, Airy Siranindi Sis Al Jufri 17 Palu is a 4-minute drive from Baiturrahman Grand Mosque and 5 minutes from Palu Bridge. When you stay at ZEN Rooms Baranang Siang Riau in Bogor, you'll be within a 10-minute drive of Bogor Botanical Garden and Bogor Presidental Palace. Free self parking is available onsite.